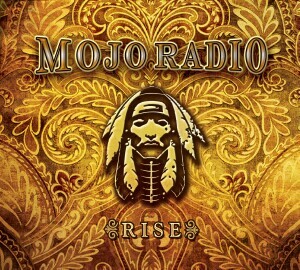 ‘Rise’ shows Mojo Radio maturing in to a more cohesive unit, mining the gritty blues-rock sound originated by the likes of Savoy Brown or The Faces, and popularized in more recent years by the Black Crowes. Their new songs are tight and trimmed of any excessive baggage, making it evident that the group woodshedded for months before committing these new songs to tape. J.P. Peterson’s guitar is crispy razor sharp in it’s recorded presence. His slide work drips of reverberation and cavernous echo, giving this material a retro nod, yet managing to pull the best from the past and plant it firmly in to the present. Adam Zierten’s vocals now sound a lot like Chris Robinson, soulfully expressive on slower more “down home” tracks like “Hold Your Breath” and “110912”. ‘Rise’ features some exceptional special guest moments. On “See It Thru”, lead guitar is provided by Jeff Massey of the Steepwater Band, who weaves in and out of the melody, balanced by J.P.’s solid chordal structure. Additionally, “See It Thru” & “Darken My Door” features keyboards by Erik “ERock” Anderson, and, on “110912”, percussion by Tim Schmitt. Mojo Radio’s CD release party is Saturday, December 14, at the Crystal Corner Bar in Madison, with special guests Subatomic.